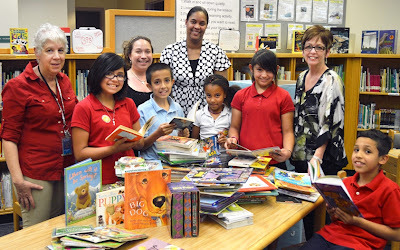 When Will it be Spring?, My Big Dog, Star Wars, Harry Potter and Captain Underpants are just a few titles of more than 500 books that were recently donated to students at Holdeman Elementary School in Tempe. The donations were a result of a book drive sponsored by Rio Salado College (RSC) students Stephanie Miller and Amber Myhrman. Miller and Myhrman were tasked to organize a campus project as members of a student public policy forum sponsored by the Maricopa County Community College District. “A book drive was the first thing that came to mind as we were looking for a project that would benefit the community,” Myhrman said. An avid reader herself, she said that it seemed appropriate that a student-driven project should support literacy. They collected 521 books, 36 activity books and two audio books to donate to the elementary school located just blocks away from the college’s headquarters in Tempe. According to Wendy Reeck, Holdeman principal, the books will put to good use. The new and gently used books were collected in book bins placed at RSC locations across the Valley. They were donated by students, faculty, staff and members of the community. Holdeman fifth grader Alejandra de Haro Felix was excited to be one of the first students to receive one of the books. “At first I didn’t like to read, but I got into one book and finished it. It made me want to read more and more. I like to learn about new stuff,” she said.